Is it climbing? Is it trekking? It’s Via Feratta! The open road inspires many to think, write, and sing songs about travel, the adventure of new and different places. It brings the hope of mile after mile meditation, problem solving, and deep inspiration in which the day-to-day gets further away and into the present moment of exit signs, new landscape, funny billboards, the sun in your eyes, passing art cars, and RVs. The road trip is the first to do on many well seasoned as well as not so seasoned travellers bucket lists, but how many take the step and embrace the open road? Despite how much I have travelled the world, and understand the fundamental gift it gives to my life, I always struggle to leave the comfort of home because of that one last thing that has to be done. Yet the journey calls. The newness of a trail not yet walked, a climb not yet climbed, the smells, the feeling of being in a different country yet in your own country. That painful, uncomfortable feeling of walking out of your comfort zone is the very thing that shatters our perspective and sometimes reinforces often what and who most important. The whole thing is travel. 10 days ago we left home and immediately found ourselves trapped in Suburban California gridlock, desperately grasping at any open country road to get us through the unexplainable traffic jam as we made every effort to escape and begin our trip. Today we are holed up in a rain storm after spending days rock climbing across the West, visiting battlefields, and walking in the shoes of Wild Bill Hickok. Last week the world lost Anthony Bourdain who inspired a world to travel more and find oneself in the most improbable aspect of a travel experience. He encouraged the fundamental and basic aspect of travel- to simply move. He wrote in his book No Reservations- “The journey changes you. It leaves a mark on your memory, on your consciousness, on your heart, and on your body. You take something with you, and hopefully leave something good behind”. May we all travel more, leave behind the day to day, embrace the inner wild in us all, use work as a means to fund the adventure that grows your soul. From a coffee shop in Western South Dakota, on borrowed internet…. Yosemite Jess R.N. Is there one mountaineering boot to do it all? So you want to climb the Matterhorn. What does it take? Climbing the iconic Swiss Matterhorn is quite the challenge. Let us unlock some of the mystery! A detailed look at my do-your-yourself Sprinter van conversion. California has the best and most consistent ice climbing on the West coast. A bold statement, but of course there isn’t a lot of competition! While it doesn’t quite compare to Colorado, Wyoming or Canada, California has a lot of what water ice climbers are looking for: long water ice flows that last for months. But where do you find these Golden State gems? Following is a sampling of California's water ice climbs. The cold, shady canyons of Lee Vining and June Lake hold some high quality ice flows from around mid-December till mid-March. In Lee Vining canyon you have two flows that are consistently formed each year, Chouinard Falls and Main Wall. Chouinard Falls is about 110 ft high and is mostly rated Water Ice 3 which makes it a great beginner to intermediate top rope flow and good for intermediate climbers to test their lead skills. About 100 ft away is the Main Wall and is about 200 ft in height and has some great climbs from WI3 to WI5. Advanced ice climbing leaders can test their skill on classics such as Cave Man and the mixed classic Heal Toe. The June Lake Loop area has two areas that are just perfect for beginners. The Roadside area known as, well, Roadside is the perfect angle of about 65 degrees for first timers. Farther up the mountainside you’ll find Horsetail Falls, which is much longer, up to 200 ft, and right about 60 degrees also. Both are great areas to try out the sport of ice climbing. Lee Vining and June Lake is where you will find guided beginner ice climbing courses in California. While the Eastern Sierra has most of the water ice climbing in California, and certainly the most consistent, there are some other areas worth mentioning. Down to the South in Sequoia National Park near Lodgepole you’ll find Tokopah Falls, which makes for great top-roping. Near Tokopah is the Watch Tower, an impressive 1100ft ice WI4 ice climb. Both of these areas may not hold good ice all winter though so you have to hit it when it’s in. To the North in the Lake Tahoe area there can be good ice climbing in the Emerald Bay area such as at Eagle Lake. Near Truckee, Ca. you’ll find Coldstream Canyon with good ice flows on some years but it does have a long approach. Lake Tahoe ice can be good, but on mild winters it can also be non-existent. And then there’s the grand dame of them all, The Widow’s Tears in Yosemite Valley. Said by some to be the longest water ice climb in North America, Widows Tears is approx. 2000ft of some thin, some fat, and sometimes some very scary climbing. It doesn’t form often, maybe every 3-5 years or so, but when it does it can cause quite the stir in the local ice climbing community. So in a state known mostly for beaches, movie stars and big cities, it is possible to find some amazingly good ice climbing. California is quite the Dichotomy. Check out our winter 2016/2017 ice climbing & winter mountaineering courses in the Eastern Sierra! The Haute Route takes all kinds. All kinds of skiers. As a “bucket list” adventure for an entire world of ski fanatics, the backgrounds of her suitors are varied and interesting. Many are curious about what it takes to do the deed. The most recent IAG Haute Route trip and group were fairly representative. We had strong downhill skiers, varied touring experience, and the entire spectrum of ski mountaineering conditions and weather. We did not complete every single section of the route, but that is far from the only measure of success up there. If you expand your definition of the Haute Route to its broadest terms, it is skiing, wine, and culture. We had all that, even without visiting the final hut or making the final ski descent. Whether you are just curious, or wish to calibrate your own preparedness, a little profile of each skier on this particular trip is apt to be interesting. Here’s the team. John is a 60-something physician from New Brunswick, Canada. He’s been a “Maritimer” (Canadian slang for those living in the eastern coastal provinces) all his adult life, except for that one winter ski patrolling out at Apex Mountain in British Columbia. John is the ultimate “bucket lister”. He’s done it all, seen it all. He’s sailed across oceans, taken up dancing as an adult, slogged through Quebec’s Chic Choc mountains, and taught some of the first ever wind surfing classes in the ‘70s. He ice skates and cares gently and effectively for other rural Maritimers. Prior to the Haute Route, however, John had basically no backcountry experience. In what is one of my favorite new phenomenons in the backcountry skiing world, John did his training by skinning up his local Crabbe Mountain ski hill. Backcountry skiing is a complicated beast. There is the uphill, the downhill, the equipment, and the hazards. Most aspiring backcountry skiers have the downhill portion pretty well sorted out. Learning the skills for ascending on skis is best done in a safe, familiar environment. More and more resorts allow uphill traffic, and more and more skiers are participating. This allows people to skin where they already know where to go, to skin where it is at least relatively safe to do so, and to skin sometimes on man-made snow when there is no snow in the wild. It’s brilliant. A number of times in recent years we have had folks just like John dedicate months of preparation for the uphill portion of a backcountry trip completely inside a ski resort boundary. John’s preparation paid off. He won’t say it was easy, but he had what it took to complete each day with enough energy to find the next wine glass. That’s success! The Haute Route was Scott’s first guided ski adventure, ever. The same could be said of other participants on this trip, but it isn’t as notable as it is for Scott. Scott has been skiing the backcountry for about 20 years. He is a competent, accomplished backcountry skier (Jed’s note: I should know. I’ve skied, recreationally, with Scott since 2003). By all measures he has the skill and experience to complete the Haute Route, unguided. He chose to come with International Alpine Guides for our intimate logistical knowledge and the margin of safety that comes with excellent guidance. Scott races bikes, skis the backcountry around his home in Bishop, CA a couple times a week, and takes at least a couple ski trips out of the area each year. He and a partner put up a respectable time at a very cold running of Colorado’s “Elk Mountain Grand Traverse” ski mountaineering race just weeks before the Haute Route. In short, Scott had no problems with the athletic portion of the Haute Route. For that matter, he had no problems with any portion of the Haute Route. He was a solid guest, for whom the most remarkable observation is his humility in choosing to employ professional oversight. We appreciate Scott’s participation, and you will appreciate professional oversight, regardless of your background. This is Gavin. Gavin’s crazy, and he’ll admit it. He’s crazy smart, crazy motivated, and just crazy. Gavin grew up in Michigan shredding trash heap ski hills. He’s spent most of his adult life in, of all places, Florida. He took some time to ski bum in Summit County, Colorado, but was mainly a free-diving, jet-setting, big-game fishing Florida redneck until very recently. His world shook up a couple years back, and he hightailed it back to Breckenridge. It was there that he found the backcountry. With a few days of touring, and an AIARE level one avalanche course, a fledgling idea to someday ski the Haute Route seemed way more realistic. Notable about Gavin’s preparation is that he injured himself just over two months prior to the trip. He has athletic prowess in excess, but a broken leg is a broken leg. In spite of his own crazy, he absolutely “toed the line” with his medical oversight and his physical therapy, while keeping us guides apprised of the situation. He bought trip insurance. He got the “go ahead” from his medical team just days prior to the trip, came with an open mind, took great care of himself (he didn’t drink, even on the wildest party night) and finished stronger than he started. Isaac and Nicki are married, California working professionals. They strike their own balance of career and mountains by living in Folsom, CA and tele-commuting. They are young, motivated, and well-conditioned to the backcountry. They, like Scott, have skied a bunch on their own in the wild. They met one another during collegiate gymnastics careers (Nicki was New Zealand’s all-around National Champion gymnast in 2003. But she won’t tell you that. Joke’s on you Nicki, Google knows…). This shared gymnastic background shows. Their respective ski histories are different (Isaac’s been at it longer. Gavin summed up all of our sentiments when he said “I want to ski like Isaac when I grow up") but the foundational athletic prowess developed in the gym is evident. While Nicki has picked up the backcountry skills pretty quickly, even doing recent annual "women's weekends" each spring to ski things like Mount Dana and the Bloody Couloir, she also learned new things on the Haute Route. When refreshing kick turns in the Vallee Blanche on day 1, Nicki noticed that even she had refined her technique. Isaac pointed out, with excellent married-man self-awareness, that "that's probably because it's someone other than your husband teaching you". Lucien came the other way around the world for the Haute Route. While the rest of us are North American, Lucien came from Australia for the trip. He insists that Australia has some skiing, but he also seems to talk it down regularly. I suppose that’s indicative of their upside-down self deprecation there. He has worked a few seasons as a weekend patroller at the resort six hours from Sydney. He describes long drives, rock hard snow, and insane winds. Working that way for your skiing is bound to cement an appreciation and toughness for the sport. Additionally, Lucien pulled up roots at one point for four years and moved to Denver to ski. My guess is that his solid performance on the Haute Route is due in equal parts to the Australian resourcefulness and the Colorado mileage. Overall, Lucien has skied for 20 years. I know this because, on day four of the Haute Route, on Rosablanche, in a spectacular sunny day in perfect glacier powder, Lucien stammered at the end of an amazing pitch of mellow fast turns, "20 years of skiing and this is the top, this is... This is amazing". It’s ok, Lucien, words don’t matter. Skiing is perfection. The Backcountry skiing in the Eastern Sierra from Bridgeport down through the Rock Creek area has been comparatively good in recent weeks (Comparative to the last four years of drought!). With a regular refresh of fresh powder finding good snow hasn't been too difficult. As usual in mid winter, you want to look in the North and Northeast facing trees. Skiing is great above 9,000 feet in the Horse Creek Canyon and Sawtooth Ridge areas with about a 3-5 foot base. The couloirs of the Matterhorn Peak and Horse Creek area are filled in with Ski Dreams looking good. However, recent wind loading made these objectives too dangerous to ski, but hopefully things will stabilize soon. It is possible to stay on skis all the way to the trail head but below 8000 feet the snow pack is too shallow to really make turns and it’s “just getting down” from there. Above 8500 feet the snowpack is deep enough to provide great skiing. The Negatives are in shape and very skiable, but once again, recent wind loading as made them a bit too unstable to safely ski. Skiing the low angle slopes off the backside of J7 lift at June Mountain has been very good. Not really enough snow to reasonably ski all the way down to the highway but you can “make it down” if you’re careful. Most people are skinning back to the resort after skiing the backcountry. Chicken Wing and White Wing off of Deadman Summit have been great with enough snowpack to have good skiing all the way back to the car. The trees have protected much of the snow from the wind. There are still obstacles down low however. The best skiing has been off the Mammoth Crest such as Red Cone Bowl. This area has been getting hit hard from the recent storms and there’s around a 4-6 foot base and little to no obstacles. Great skiing is to be had on the crest, but as with other areas there has been lots of wind loading recently so the steep stuff above 35 degrees hasn’t been skied in the last few days and is still dangerous. They recently just got 7-13 inches of new snow up on the crest. Further East, Punta Bardini and the Tele Bowls are finally good with enough snow depth to provide mostly worry free skiing. However, there are still some obstacles down low. Areas such as Solitude Canyon and most of the Sherwins are skiable but with areas of low snow cover. We could use more snow in this area for sure. No many reports from here, but the word is that the further South you go from Mammoth the less snow there is. Sounds like these areas South of Mammoth and East of the crest really need some more snow to make it worthwhile. As always, check the local avalanche conditions before you head out. In the Eastern Sierra we do not have an official avalanche forecast. However, you can check to latest snowpack summary at the Eastern Sierra Avalanche Center And if you don't have any avalanche training or backcountry ski exeperience, you should go take a AIARE avalanche course or hire a qualified backcountry ski guide. The ice is in! In Lee Vining Canyon in the Eastern Sierra we have seen the best early season ice in at least 45 years, according to Doug Nidever who has been climbing here that long. In fact, the ice is looking better than at almost anytime last season. The early precipitation and unseasonable low temperatures have really made for some great early season ice climbing. Chouinard Falls ice is fat in the middle flows and thin but climbable on the far left flow. The right flow, which hasn't seen much ice in recent years, is starting to come in. The Tree Route in the middle of the cliff isn't really forming up yet which had been typical the last 5 years. Yesterday, we found the ice to be wet and sticky... perfect conditions for the first time out this season. Temps were right around freezing in the middle of the afternoon, or just a little above, with lows in the 20's at night. Main Wall is the biggest surprise. The middle flow is fully climbable with fat ice the whole way except for a thin section on the first 25 feet. Reports from those that climbed it said the ice was great and they were able to get in good ice screws the whole way. Spiral staircase on the left side is beginning to form up with at least some ice from top to bottom. However, it may be a bit longer before it becomes a reasonable lead. We haven't seen this gem in shape in years! Caveman on the right side is beginning to form up nice and should be climbable soon hopefully. The lower angle ice climbs further up canyon from Chouinard Falls are fully in and fat, which is typical early season. And the "slabs" above Chouinard Falls are also coming in. As for the approach to Lee Vining Canyon, it could be better. We need a lot more snow to cover the talus, but overall it wasn't too bad with a trail somewhat packed down. However, with just a little more snow on the way tonight the approach could become more tricky with some fresh powder covering up the holes between talus blocks. Overall, there is lots of water flowing in Lee Vining and temps have remained cold enough at night to allow for good ice formation. With more moisture coming our way tonight and lows projected in the teens next week things should only get better! 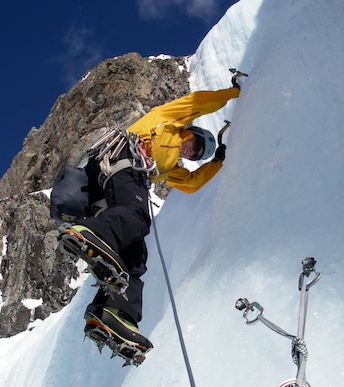 We are getting very excited about our upcoming ice climbing courses. This is the year to get out on the ice. Elsewhere in the June Lake Loop, Horsetail Falls looks as though it is in shape. However, reports from yesterday were that the ice was hollow and a bit scary. Probably best to give that one another week or so if daytime temps don't get too high. Do you alpine climb or backcountry ski and do not own a pair of soft shell pants? If the answer is yes, go buy a pair now. Yes, they are really that essential. That’s why it is very rare to see a professional guide in the mountains without them. So what exactly are “soft shell” pants? They are an outer-shell pant made from synthetic materials, such as polyester and nylon, and they are NOT waterproof. The fact they are not waterproof is actually why they are so valuable in your quiver of outdoor clothing. They are extremely breathable, highly wind resistant and slightly rain and snow resistant. Being an outer shell layer, they have little to no insulation. This would be in contrast to what is known as a “hard shell’ pant which is waterproof and somewhat breathable. At times the hard shell is an essential layer of clothing, but not nearly as often as you may think. The reason soft shell fabric breathes so well is the fact that they are not waterproof. What many people do not realize is that the many waterproof/breathable fabrics on the market (such as Gore-tex) may be breathable, but they do not breath well enough for high exertion in the mountains. So what tends to happen with waterproof pants is you get clammy and sometimes downright wet from your own sweat and water vapor not being able to escape quickly enough. This leads to the exact opposite result of why you are wearing your waterproof pants in the first place. So how do you stay warm and dry with a non-waterproof pant with no insulation? Simple physics is the answer. When you are working hard breaking trail through knee deep snow you are sending lots of moisture out of your body in the form of vapor or sweat. With a soft shell material that vapor is continually being pushed out into the world. While this is happening it is very hard for moisture from the outside to make it inside against the flow of your bodies water vapor escaping, thereby keeping it outside where it belongs. In addition, soft shell materials with no insulation dry very quickly and do not hold moisture much, if at all. If the thin soft shell pant is just not quite enough warmth for the temps you are facing you can then add a layer of long underwear underneath the pant, which doesn’t affect the breathability at all. There are many different types of soft shell materials on the market. One of the original and still one of the best is the Swiss-made Shoeller fabric used by many clothing manufacturers such as Black Diamond. Other companies, such as Patagonia make their own soft shell material, also excellent. All these materials have at least some stretch in them, another big plus for soft shell pants. Some examples for skiing would be Black Diamond’s Dawn Patrol Touring Pant and Patagonia’s Dual Point Alpine Pants. For climbing there’s Patagonia’s Alpine Guide Pant and Black Diamond’s B.D.V. Alpine Pant. There are also hard shell jackets and pullovers which are great layers to own in your quiver but perhaps not as essential as the soft shell pant. Keep in mind that a soft shell layer is one layer in a complete layering system including base layers (long underwear), insulating layers (such as down jackets and fleece) and outer layers. So should you go out and ditch those bulkier hard shell waterproof breathable pants? No! If you find yourself standing around in a driving rain or in very wet snow, the hard shell pant is absolutely essential. But when you find yourself working hard aerobically in dry, windy or damp weather then yes, ditch the hard shell/long underwear combo for a pair of comfortable soft shells. You can always put the hard shell pant on over the soft shell, but you’ll find you may be doing that less than 20% of the time. Once you own a good quality pair of soft shell pants you’ll find them to be your go-to pant and wonder how you ever managed without them. “You have one of the best jobs in the world”…. I hear that a lot. I fully agree, yet a job it is. And one that demands a high level of professionalism to be successful at. As a fulltime mountain guide and guide service owner, I am often asked how does one become a mountain guide? First off, let me clarify what exactly I am referring to when I use the term “mountain guide”. I am talking about an individual in the United States who guides and instructs paying guests on technical mountain terrain whether it is on ice, rock or snow and on foot or on skis. I will leave outdoor educators and backpacking/trekking guides out of this discussion as those careers demand a somewhat different set of skills and career paths. Guiding on the Eiger. Berner Oberland, Switzerland. Mountain guiding is not for everyone. It is a demanding job that can be hard on your body. It requires a lot of people skills and very good judgment and decision making while under pressure. And that is only after you have mastered the technical skills to even start mountain guiding, but he best climber or skier is not necessarily the best mountain guide. But like anything that is difficult to achieve, it is a very rewarding career. In the United States, we have very diverse terrain on which we guide. Therefore, we have a diversity in our mountain guides. There are three main disciplines of mountain guiding and they are rock guiding, alpine guiding and ski guiding. One can choose to become just a rock climbing guide, a ski guide or an alpine guide. Or one can decide to join the few who become all round mountain guides skilled and certified in all three disciplines. So where do you start? In the United States we don’t have any uniform regulations that state you must have any formal training in mountain guiding to actually work in the field. The only universal course one must take is a 10-day wilderness first responder medical course. Now just because our land managers have been short sighted and do not require any formal professional training in guiding techniques doesn’t mean you should not seek them. The courses and certifications are out there and it is imperative for anyone who is serious about making mountain guiding a career to get the proper professional training in the terrain they wish to guide. The world of guiding is changing and soon it will be very difficult, if not impossible, to get a job guiding on technical mountain terrain without the proper professional training. So your first step beyond a medical course is to seek out professional training by an organization that trains and certifies mountain and ski guides. For mountain guiding in all the disciplines there is only one organization that trains and certifies guides and that is the American Mountain Guides Association. It is also the only US guide training organization that is recognized by the International Federation of Mountain Guides. The AMGA trains and certifies guides in rock, alpine and ski guiding. For rock guiding up to shorter grade III rock climbs there is also the PCGI (Professional Climbing Guides Institute) And for mechanized ski guiding (using helicopters & snowcats) there is the Heli Ski US Mechanized Guide School. Just about all of the above programs require prerequisites in climbing and skiing skills before you can even enroll in the first course. So you must make sure that your skills are good enough before you even begin the process. 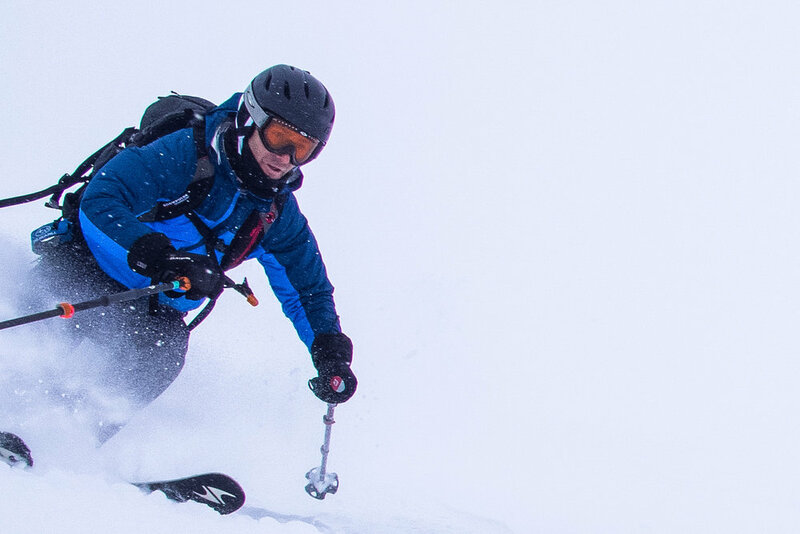 Get out and gain the necessary experience in climbing and backcountry skiing before you even consider guiding, as a guide training course is not the place to learn how to climb or ski. Not such bad professional training to have to go out and ski and climb! For any of the programs listed above you can go to their websites to check the prerequisites. Once you’ve gained the proper personal climbing and skiing experience, and have taken the WFR medical course, you can start applying to guide services for a job. This may or may not come before you have had any professional training courses. However, you are much more marketable if you have at least one AMGA or other course under your belt. Many reputable companies, IAG included, will not allow someone to work as a lead guide without some outside professional training in the terrain they are working in, and many are certified within their disciplines (and for IAG. those standards will rise in the next couple years to include more stringent terrain specific training & certification requirements). Also, think about it. Would you go to a dentist or a chiropractor that had no formal training? Of course not. So why should we expect the guided public to put their lives in the hands of a lead guide who also has received no standardized professional training. However, there are some mountain guiding venues that are on semi non-technical, non-glaciated terrain where having a prior guides training course is not as crucial. These can be great entry level guiding jobs. Once you’ve gained the personal climbing & skiing experience, received the proper training and landed your first guiding gig be prepared for it not to be a year round full time job. Sure, there are venues such as Mount Rainier where you are guaranteed full time work for a few months in the summer season but you’ll be ski patrolling or waiting tables the rest of the year (for some this is ideal). In some areas of the country you may find yourself making yourself available for guiding work but not getting much of it and either having to live in your truck (reducing the expenses) or getting an additional job (increasing the revenues). So it can take perseverance to break in. Want to make it a year round full time career? Then get fully certified in all disciplines and be prepared to travel. If you can roll with the seasons and guide rock & alpine in the summer, do a few international alpine trips in the off season and guide ice climbing and/or skiing in the winter then you certainly can make it as a year round full time guide. But it’s hard to get year round work as a simply a rock climbing or ski guide. You may even decide to eventually hang your shingle and work as what many call an “independent guide”. One who runs their own business with their own clients and either guides under their own permits or works with other guide services, or both. As mentioned, the AMGA is the only guide training organization that offers courses and exams in all three disciplines. In a nutshell there are 2-3 courses and a certification exam in each discipline. If you are going to make guiding a career it is expected you would eventually gain a certification in the disciplines you wish to work. If you become certified in all three disciplines through the AMGA you are then recognized by the International Federation of Mountain Guides Association (IFMGA) as an internationally licensed mountain guide. This is a requirement to work in many other countries of the world including all of Europe and some of South America. Currently there are only around 100 IFMGA licensed mountain guides in the United States. IFMGA status is a big commitment though and takes about as much time and money as an average Masters degree. You can learn more about the AMGA guide training program on the AMGA website. So to recap, the first step to becoming a mountain guide is to gain the proper climbing and/or backcountry skiing experience. If you are just starting out, this could take many years. The second step is to take a WFR course and at least one professional guide’s training course from the AMGA or other reputable organization. The third step is to find a job with a guide service that guides in the terrain in which you have experience and training. If you then decide mountain guiding is for you, you can continue your professional training and seek certification in the disciplines you wish to guide. It’s really that simple. Then you’ll be on your way to one of the best and most rewarding careers in the world! Chamonix sits in a large glacier-carved forested valley at about 3000 feet in elevation. If you were to arrive in foggy weather it wouldn’t look like much…some nice trees and a lot of fondue restaurants. But once the clouds parted it might blow your mind. You would see Mont Blanc at almost 16,000 feet right out your hotel window, large glaciers spilling down the sides of the valley and the rocket ship-like top station of the cable car looming 9000 vertical feet straight above. Not many places in the world have this amount of vertical relief. The Chamonix Valley is home to a number of small alpine communities with Chamonix being the hub (and most crowded). Prior to 1740 the valley was inhabited only by modest sheep farmers. To middle ages people the spectacular scenery was only a nuisance of landslides, bad weather and encroaching glaciers as the little ice age caused the large glaciers to actually advance right into the valley itself. In 1741 two English explorers “discovered” the Chamonix Valley and regaled the world with tales of their exploits amongst the Mer de Glace or “sea of ice”. The tourist boon began. In 1760 a local doctor put up a cash prize to the first person to summit Mont Blanc, the highest peak in Western Europe. Finally, in 1786 two locals, Paccard and Balmat, succeeded in reaching the summit and thus the sport of climbing mountains was born. Since then Chamonix has hosted the first winter Olympic games in 1924 and subsequently saw infrastructure take off, notably with the Aiguille du Midi cable car and the proliferation of hotels. Today, Chamonix is one of the most important tourist destinations in the Alps overflowing with a multitude of lodging from basic bunkhouses to 5-star palaces and restaurants from simple burger joints to Michelin two-star fine dining. Chamonix has moved quite far from the small farming village it once was. Don’t expect the peace and quiet of the mountains. Home to three major ski resorts and some of the best alpine scenery on the planet, this town is ground zero for alpine tourism whether it be of the technical kind or of the tourist kind. In the middle of ski season, and also in August, the town is quite simply very crowded. August is a month in which all of Italy and much of France take off from work and many of them head for the mountains. Be prepared to get close! English is spoken by just about everyone here making this a bad place to immerse in the French language. In fact, many of the locals aren’t even French. There’s a sizable Scandinavian and British community here. Chamonix has a large pedestrian-only central section along the glacial-silt-tinged L’Arve River. This is the hub of the town and where you will find many of the restaurants and shops. Outdoor gear stores (check out Snell Sports if you want to drool over gear) are many and most of the major outdoor gear & clothing companies are represented with company stores. The other section of Chamonix is Chamonix Sud (South in French) where you will find the Aiguille du Midi cable car, more restaurants, bars, and lots of apartments. If coming from other parts of Switzerland such as Zurich, there is a local train that connects with the uber efficient Swiss rail system at Martigny in the Swiss Rhone Valley. The slow cog wheel train ride from Martigny to Chamonix is quite spectacular. The Swiss Rail website SBB is an excellent source for planning rail trips. A car is not required to get around the Chamonix area. There is a bus and train service that is free from Les Houches all the way to Vallorcine if you are staying in a valley hotel. Schedules are posted at every train station and bus stop. This is probably the most amazing cable car ride in the world. It will whisk you from the center of town at 3000 feet to the glaciers at the top of the Aiguille du Midi at well over 12,000 feet…in 20 minutes. The exit out of the cable car is, well, technical. It requires ice axe, crampons and possibly a rope as a fall would be fatal. The Aiguille du Midi top station gives the climber and skier access to an almost endless world of climbs and ski descents. Open only in summer, this spectacular fixed gondola ride takes you high across the famous Vallee Blanche from the Aiguille du Midi top station all the way over to Point Hellbronner in Italy. It is convenient for accessing climbs over by the Italian border. Part of the Flegere ski resort in the winter, this cable car and the Index chairlift give you access to all the rock climbing the Aiguille Rouges have to offer. In winter, it is used to access off piste skiing off the backside of the Flegere ski resort such as the popular Col du Brevard. Another two stage cable car and part of the large Grand Montet ski resort in the winter. In summer it is used to access the climbs off the Argentierre Glacier as well as the Petit Aiguille Vert. In Winter, it is the starting point of the famed Haute Route Ski Tour as well as being the access for off piste skiing and numerous ski tours off the Argentierre Glacier. Leaving from near the center of town, the Brevent Gondola and cable car are part of the Brevent ski resort in the winter and give the off piste skier access to some fun side country slopes. In summer, there is fine cragging on the rock climbs of Brevent. Le Munchie: A locals favorite for fine dining with reasonable prices. On one of Chamonix’s oldest streets and run by Swedes, they serve eclectic Asian fusion dishes. It is advisable to make reservations. The Jekyll & Hyde Pub: Housed in a 16th century building in Chamonix Sud, this English style pub serves up excellent pub food and burgers. It’s also a great place to grab just a pint. Sunday is BBQ rib night. Le Panier des 4 saisons: Probably the best French restaurant in Chamonix without getting into Michelin stars. Tucked away off the pedestrian walkway with a modern alpine décor. Bighorn Bistro: Longing for a real American breakfast done right complete with endless drip coffee? This is your place. A newer addition to Chamonix Sud, this bistro is run by American expats and they are doing a fantastic job. Dinners are awesome also. MBC (Micro Brasserie de Chamonix): Run by Canadians, this is Chamonix’s only microbrewery. North American style décor and great burgers and ribs are served up. Le Chaudron: If you’re looking for traditional local Savoyarde cuisine this is a top choice. Also on Chamonix’s oldest street, this tiny restaurant oozes charm. Make a reservation. Elevation 1904: A local’s favorite watering hole across from the train station. In good weather when the outside seating is set up there are few places better to sip a blond beer and people watch. They also serve up great afternoon snacks and a hearty English breakfast. Poco Loco: A “Fast food” burger joint right in the middle of town. Some of the best “fast food” burgers I’ve eaten with local ground beef served on fresh baked local bread… a top lunch choice. Chamonix has no shortage of accommodations (unless it’s August or Christmas!). Here are a few of my recommended establishments. Apartments are a great deal if you are staying for a week or more as they are usually cheaper than hotels and you can choose not to eat out all the time. Gustavia: A 3-star hotel right across from the train station. Rooms are very modern and are a great deal but they are a bit small. Run by Swedes so of course they speak perfect English. Can be a bit noisy due to the popular Chambre Neuf bar downstairs (for some not a disadvantage). Hotel L’Arve: Another great 3-star hotel in a quiet location right on the river L’Arve. It features more traditional décor with a large lobby and a nice bar. Grand Hotel des Alpes: 4-star luxury accommodations right in the thick of things in the center of the pedestrian area. If you are looking to impress someone or just want to have that extra comfort, this is a great choice. There are so many apartments it’s hard to make a list. But the ones in the Chamonix Sud complex are usually a great deal. Check out Pierre e Vacanes. Le Vagabond: If you are looking to go cheap and don’t mind dorm style accommodation, check out this gite just South of the main part of town. In Summer there are numerous campgrounds which can be a bit densely packed compared to the typical US forest service camping. One of the nicest is the Mer de Glace camping up the valley in Les Praz de Chamonix. It’s very clean and even has wireless. So there you have it, Chamonix in a nutshell. For those planning a trip I hope this helps with some of the logistical planning. As for planning your adventures in the mountains, I can only say that Chamonix is a complicated place where things can get very real, very quick. If not hiring a guide (an excellent idea for those of any ability on their first Chamonix ski mountaineering or climbing trip) it is highly advisable to keep things very conservative and well below your limit on your first trip here. It can take years to get a real hang of the place. “The ledge is gone”, said Drew over the phone as I was driving down the highway. “What do you mean gone? !” I retorted. “It’s just missing, have you heard anything?” he asked. I was blown away. How does a huge ledge that countless climbers have slept on since the 1950s simply disappear? I got the call from Drew as I was driving up Highway 395. He was at the top of pitch 11 (about 1000 feet up) on the regular Northwest Face Route of Half Dome, one of the most popular big wall routes in the world and one of the fifty classic climbs of North America. It’s also one of my personal favorite climbing routes in the world and one that I’ve repeated six times, including once with Drew. I quickly got on the popular climbers forum, Supertopo, and queried the community if anyone had heard about any rock fall on Half Dome. No one had heard a thing. Some thought it to be an April fools joke a few months too late. Soon Drew texted back photos that confirmed the worst. Not just the bivy ledge, but a full two pitches of the iconic route had in fact just fallen off. The Regular Northwest Face route was no more…at least as we knew it. The route was put up in 1957 by the Yosemite climbing pioneer Royal Robbins along with Jerry Gallwas and Mike Sherrick. They had attempted the route the year before, but had been beaten back after six pitches and returned the next year to put up the first Grade VI rock climb in North America. It was a seminal achievement in the climbing world and proved that massive the rock faces of the world could be climbed. The race was on to scale even bigger and more committing climbs. Meeting the team at the top with champagne was none other than Warren Harding who already had his sights on something even bigger. The very next year he would go on to complete the first ascent of El Capitan’s Nose Route. The Regular Northwest Face Route (RNWFR) has seen it’s share of media over the years. In 1976 a team consisting of Doug Robinson, Dennis Hennick and Galen Rowell climbed the route clean, meaning without the use of pitons, which scar the rock. They only used nuts and chocks (camming devices were not quite invented yet) increasing the difficulty considerably. They wanted to prove that pitons were not always needed. Rowell brought his camera and the ascent was featured in a National Geographic article titled “Climbing Half Dome Clean”. The clean climbing revolution was on. More recently the RNWF route saw it’s first free solo (no ropes, no safety net) by Alex Honnold. It was also featured in National Geographic including his “Oh God, I’m screwed” moment when, just a few hundred feet from the top of the 2000 foot route, he became paralyzed when he was sure his foot would not stick to a glassy hold. His foot did stick of course. So how does two pitches of such a popular route on such an iconic feature simply disappear? The answer can be summed up in one word…exfoliation. Half Dome was not formed by being shaved off by ancient glaciers, as some may think. In fact, Half Dome sat mostly above the largest glaciers to roll into Yosemite Valley. The Northwest Face of Half Dome has been exfoliating for many thousands of years, peeling off like a giant onion with successive glacial episodes carrying off the debris. So what occurred last week was just another small act in a play thousands of years in the making. Of course there will be many more as Half Dome continues to disintegrate. "Several hundred feet above the base, the narrow crack in which we were inserting pitons widened. It became a chimney, large enough to crawl inside. At either side of the back wall of the chimney there was a three-inch crack, continuing out of sight for hundreds of feet overhead. The back wall was eight feet behind the present surface, parallel to the main cliff. The cracks completely separated it from the outer rock, on which I was climbing. Here was the northwest face of the future, fully cleaved and waiting patiently, be it one or one hundred thousand years until it gleams for a geological moment in the noonday sun." Drew climbing the last few feet to the summit of Half Dome. You can see the many layers of rock that have been exfoliating like an onion for many thousands of years. Yosemite National Park geologist Greg Stock estimated the size of the block that fell to be about 200 feet long by 3-9 feet thick and about 800 cubic meters. The slab probably fell during some recent heavy rainstorms, which could have been the final grain of sand that brought the unstable feature down. The rainstorms were also responsible for keeping climbing parties off the route, which normally sees at least one party a day. As it was no one was on the route or anywhere near it when the rock fall occurred. One detail of note is that the climbing anchor that was put in years ago to secure climbers sleeping on the ledge was intact and in good shape, but with no ledge below it. It is quite conceivable that had anyone been sleeping on that ledge when it fell they would have had a very rude jolt out of their sleep to find themselves hanging in space, but otherwise unscathed! Now that would have been quite the story to tell. The story of the Half Dome rock fall took on a small life of it’s own as main news outlets such as the Associated Press and the LA Times picked up the story. Once again, the Regular Northwest Face Route of Half Dome was making the big time and I’m sure it wont be the last. There’s still a new first ascent of a new variation around the rock fall zone waiting to be had! Often times our guides hear clients say with a sense of astonishment and a twinge of heartache, “you live such an amazing life!”. If you probe deeper you will find the backstory of many of our guides have similar past choices as anyone else. We simply just came to a point, in one way or another, that we couldn’t turn back from. What turned out to be weekend trips out in the mountains turned into every-vacation-in-the-mountain trips. That eventually grew into having-a-car-as-a-basecamp throughout the summer months and maybe just another week or two or three into Autumn. The weekends turned into years, which turned into a lifestyle of being outside spending our time in the elements. We heard the forewarnings from our peers and family. Of course we could make more money with the degrees we have and we want to apply what we academically learned. Of course we want paid sick days and to have our health insurance covered. Of course we’d rather not cook in a rainstorm and would love to sleep on a real pillow. Of course we want to secure our retirement plan and have our contributions matched. And, yes, a shower would be nice! For me, the question at the end of each day is how much life did that cost me and was it worth the experience? The turning point, or as Kafka called it “the point of no return”, happened to be a lifestyle we could not live without no matter what the apparent cost was. How can something chosen on such an innately internal level feel anything other than right? We’ve decided to be continually schooled by the mountains not for the checklist of the summits but for the humility and diversity of the experiences. Imagine waking up with the sun and the sounds of the forest, drinking the best brew you could imagine while feeling the sun start to warm the ground, starting the morning commute hiking through aspen groves and along wildflowers and over granite talus fields, feeling your muscles warming you up as you go, sweating, resting when you’re ready to rest, eating when you’re hungry to eat, breathing that fresh sweet air, seeing pure beauty in between blinks, swimming in clear alpine lakes, laughing around a campfire far into the night with a friend, letting the conversations wonder, and falling into a deep sleep under the warm summer milky way sky. Each day is different, each climb is different, yet you know the sun will rise without your assistance. There’s a sense of security in having an absolute each day and a flexibility within that. Sometimes there are things in life more persistent than one’s own heartbeat. I’ve always known to take heed to those things and have been met by life with some sublime generosities. So was the cost worth it? A man told me once that the thoughts and feelings we have when we first begin to awake are similar to the ones we encounter when we’re dying. Waking up to the sun at dawn feeling well and a somewhat empty lightness in my heart is worth the cost. The Black Diamond First Light tent has been my go-to tent while on guiding and personal climbing missions for the past 9 years. Many other guides I know use it as well. It’s certainly not a new gear item on the market and while I obviously am very happy with it, it is not the tent for everyone. It is a very lightweight single wall shelter that I find indispensible on most backcountry trips when a tent is needed. It is modeled on the I-tent, a popular Bibler-designed alpine climbing tent. It weighs in at 3lbs 5oz (packed weight) and compresses down to 6 by 9 inches. It officially is a 2-person tent with one door. The poles are lightweight DAC Featherlight poles. It also has a zippered mesh window, which is so important because many times I only bring a tent because of mosquitos. First of all, it is not waterproof. But does this really matter? Well, it depends. It is made of Black Diamond’s Nanoshield fabric which is “weather proof”, but not completely waterproof. The pros of not being waterproof mean the fabric is more breathable, lighter weight and more packable. It is highly water resistant and it will be fine in a light rain, hail and even a snowstorm. But put it in a wind-driven sustained rain storm and you will find leakage for sure (I ruined an iphone once because of this). So the fact that it is not fully waterproof will not matter if you are using it in cold winter environments, or in less rainy regions such as the Sierra Nevada. But it’s probably not the best Pacific Northwest tent. At 27 square feet this is not a roomy 2-person tent, but it is a palatial one-person tent. So if you are looking for that tent for one and would like to actually sit up inside your tent and have room for some gear, then it is the right choice. Also, if you are a team of two looking to go very light and fast, and still need to bring a tent, then it’s also a good choice. One nice feature that makes up for some of the lack of space is the Firstlight’s steep wall design, which maximizes usable space. However, two people will be very cramped inside this tent, especially if you are over 6 feet. Like many of this tents features, one other concern is also one of the tent’s strengths. The material is so lightweight that it is not very durable. My first Firstlight tent was destroyed when a gust of wind blew it over when I was setting it up with a partner (“I thought YOU had a hand on it!”). It tumbled only a few feet across granite but that was enough to put numerous holes on one side. The point here is to be extra careful with it, and it will last. So, there’s the scoop from a 9-year veteran of the Black Diamond Firstlight tent. Bottom line is that if you are not in driving rain, you are not particularly large and are careful with it, this is one heck of a lightweight and compressible tent.